Home / 2013 / Blending for Perfection . . . . or just blending . . . Some of the decisions are easy – I only did one lot from Watch Hill in 2010, so the Grenache from Watch Hill is what it is. 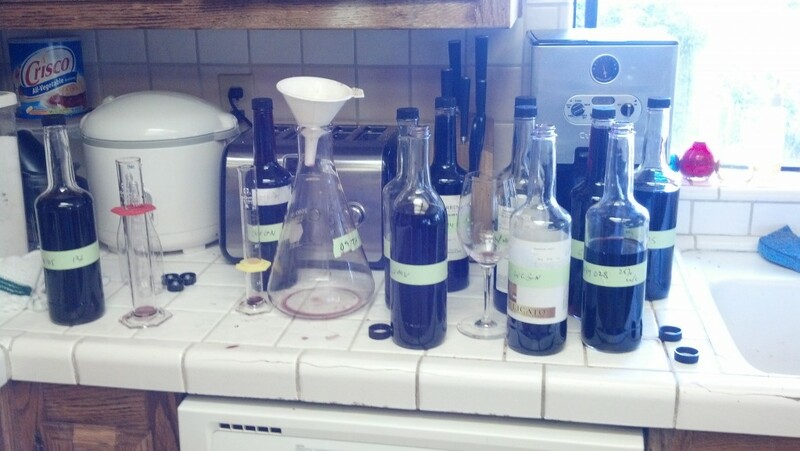 Now I still need to determine which barrels make it into the final wine, and which one or two may end up in a blend somewhere else, but that decision is fairly simple. I then have single vineyard variety decisions that are made a bit more difficult in that I either treated the grapes ‘differently’ that vintage or actually brought in more than one lot that year (different picking times; different clones). In this case, I put together sample bottles of each different ‘variable’ and tried a multitude of combinations until I came up with my favorite 2 or 3. What to do then? Get a little help from my friends – other winemakers in the area; folks who work in my tasting room; visitors to my tasting room. I listen to all of the feedback, but at the end of the day, I make the decision that I think will produce the best wine in the long run. Other decisions are much more complicated. I make a couple of blends of different varieties, and in this case, I usually have a multitude of variables to choose from. I go into the process thinking I know what I want to achieve and try to move the blends in that direction – sometimes this works and sometimes it doesn’t. I am ultimately surprised that some of my ‘intuitions’ are correct and an equal number(or more!) are way off base (-: It’s a fun and humbling process. And after I’m all done – do I ever second guess myself? Actually, I do not – once I finalize a blend and determine which barrels will go where, I usually stay ‘hands off’ until the blends are in tank getting ready to bottle . . . at which it’s simply too late to make any changes. And that’s just fine with me. I appreciate a winemaker that never looks backwards after making a decision.